As far as travel insurance providers go, World Nomads gets it. This is not your daddy’s insurance company, they’re one of the best out there with a huge social community, a generous helping of safety advice, podcasted language guides and a blogging platform set up to help their clients document their trip along the way. And today with a little help from AirTreks, they’ve rolled out a contest! In effort to showcase the need for modern travel insurance, World Nomads is looking for the most horrific travel tale you’ve lived to tell about. 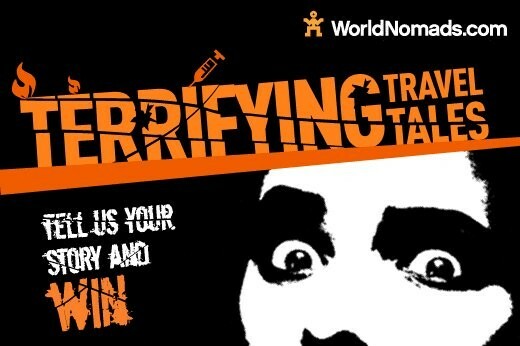 Share your most Terrifying Travel Tale for a chance to embark on a new adventure. The winning entrant will be able to chose from 4 awesome trip options that will help build confidence on the road. Whether you immerse yourself in an unknown culture, learn a new skill, give back to a local community or get off the beaten path – we want help you put your terrifying tale behind you and develop your travel cred. If your tale is chosen as the winner you’ll have not one but four different trip options to choose from: either Fiji, Argentina, Turkey or Cambodia. The best part is, with or without an entry you get to vote for the winner. Take a look at their Facebook page for details on how to vote. Submissions will be accepted from Sept. 8 to Nov. 30 with the winner being announced on Dec. 20, 2010. Take a look at the WorldNomads Adventures blog for more information about this great contest. Happy dredging and best of luck, courtesy of World Nomads and AirTreks.